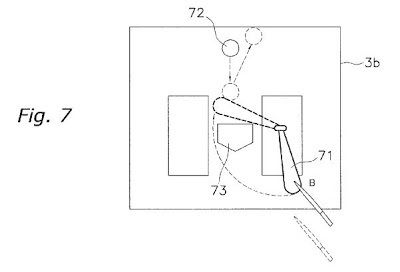 The ‘368 patent describes a method for playing a baseball game on a hand-held game system where the player has control over the swing of the character. The player can rotate their character to produce a swing and, if the timing is right, to produce a hit on the ball. The speed of the bat is determined by the rotational speed the player inputs into the character. With a game implemented by the present game program, a touch panel type of monitor will be used, and a bat character displayed on the touch panel type of monitor will be rotated by a command means from a first position to a second position while the command means is in contact with the bat character. Then, the bat character will be rotated in reverse from the second position to the first position based upon the characteristics set in the bat character in response to the amount of rotation. 1. A computer readable medium storing a game program for causing a computer to implement a game in which a rotatable bat character is displayed on a touch panel type of monitor, comprising: code for allowing control unit to recognize a first coordinate of input means which is placed into contact with the monitor, and allowing the control unit to recognize a position of the bat character as a frist position in case that the control unit identifies the first coordinate with at least any one of coordinates in the bat character; code for allowing the control unit to recognize a second coordinate of the input means after movement when the input means has moved in contact with the monitor, displaying the bat character, which is rotated from the first coordinate to the second coordinate around a coordinate of a predetermined point, on the monitor, and allowing the control unit to recognize a position of the bat character after rotation as a second position; code for allowing the control unit to calculate rotation between the first position and the second position when the bat character has rotated from the first coordinate to the second coordinate and allowing the control unit to set the rotational speed of the bat character in response to the amount of the rotation; code for allowing the control unit to issue command to rotate the bat character in reverse from the second position to the first position based upon the rotational speed set in the bat character when the recognition of the second coordinate has stopped; and code for displaying the reverse rotation state of the character on the monitor when the command is issued by the control unit.